We’d love your help. Let us know what’s wrong with this preview of An Armful of Animals by Malcolm D. Welshman. Once qualified as a vet Malcolm has to attempt life-saving surgery on his beloved Malcolm D. Welshman has had a lifetime filled with exciting encounters with animals. As a lad in Nigeria, he is attacked by soldier ants and terrified by a snake in his treehouse. His treasured companion, Poucher, an African bush dog, prevents him and his mother from being savaged by baboons. To ask other readers questions about An Armful of Animals, please sign up. As an animal lover, I was looking forward to reading this book and was captivated from page one. An Armful of Animals opens with remarkable tales about the author’s adventuresome childhood in Africa and his relationships with a variety of animals. Some are scary, others downright eccentric and then there is the special bond he develops with his faithful dog, Poucher. A change in his father’s military posting results in the family’s return to England. Malcolm trains as a vet, and it is his career As an animal lover, I was looking forward to reading this book and was captivated from page one. An Armful of Animals opens with remarkable tales about the author’s adventuresome childhood in Africa and his relationships with a variety of animals. Some are scary, others downright eccentric and then there is the special bond he develops with his faithful dog, Poucher. A change in his father’s military posting results in the family’s return to England. Malcolm trains as a vet, and it is his career at a thriving animal hospital which is the focus for the majority of stories. One of the facets I love most about this book is the breadth of emotions the author conveys in his observations on both humans and animals. His descriptions of beautiful scenes and horrifying situations are vivid and eloquent. Some of his veterinary cases are incredibly moving, while others made me laugh my head off. I also had to giggle at the anecdotes involving his work colleagues. Malcolm Welshman is one of those skilled authors who can write with style and poignancy. His humour, humility and great love for all creatures shines through, the combination of which makes this a superb book, and especially so for animal lovers. My Review of An Armful of Animals by Malcolm D, Welshman. An Armful of Animals is an interesting read that is written from a vet’s perspective. I liked how each chapter read like a memory recall shared either through pets such as snakes, dogs, and hamsters that came through the practice doors, or through the pets that belonged to the vet himself and how they impacted his life. I think in some way everyone who has owned a pet can relate to the love and some time mishap that the author describes in My Review of An Armful of Animals by Malcolm D, Welshman. An Armful of Animals is an interesting read that is written from a vet’s perspective. I liked how each chapter read like a memory recall shared either through pets such as snakes, dogs, and hamsters that came through the practice doors, or through the pets that belonged to the vet himself and how they impacted his life. I think in some way everyone who has owned a pet can relate to the love and some time mishap that the author describes in this book. The book itself follows Malcolm through his early years of being a vet and we are introduced to the many pets that he treats and looks after throughout his life, such as the hamster with pins and things stuck to his face. Will Malcolm discover he has a magic hamster on his hands? Or is there a simple answer? Or will he find the Snake that went missing from his basket? You’ll have to read this book to find out. My cat Smokey huffed at me when I read him the chapter where we discover Malcolm does not have the best of luck with cats. I think if he could speak he’d say cats don’t like the vets’ smell around them. This book showed that no one is perfect, including vets. I found that the pet owners in this book are really relatable, from looking up their worries online, so when they got to the vet they had the knowledge to ask questions, rather than letting the vet look at their pets and just diagnose, which has become much more of a need I think these days than when I was a child. I liked the author’s honesty of how some patients’ owner sometimes frustrated him, especially those with huge demands such as home visits. But to his credit he did go and that I’m sure meant a lot to those who need it most. This was honestly such a joy for me to read. I am a big animal lover and reading all Malcolm's stories about how animals have played such a big part in his life was very heart-warming. It is a book with many ups and downs, but the good definitely outweighs the bad. I shed many tears during the reading of this, including tears of happiness and sadness. The animals weren't just 'dogs' 'cats' etc. they were ALL individuals with their own personalities and I loved learning about each and every one of This was honestly such a joy for me to read. I am a big animal lover and reading all Malcolm's stories about how animals have played such a big part in his life was very heart-warming. It is a book with many ups and downs, but the good definitely outweighs the bad. I shed many tears during the reading of this, including tears of happiness and sadness. The animals weren't just 'dogs' 'cats' etc. they were ALL individuals with their own personalities and I loved learning about each and every one of them. One part that really has stuck with me is his cat waiting for him at the top of the stairs to claw his head! I couldn't stop laughing and shared the story with my sister, who also found it hilarious. Malcolm Welshman writes with a gentle humour of his lifelong love of animals. I particularly enjoyed the chapter on his boyhood jaunts to watch wildlife, and keeping a Nature diary. Life as a vet holds challenges in human form too, with a varied cast of characters adding to this memoir's charm. ‘An Armful of Animals’ is the latest book from retired vet turned best-selling author, Malcolm Welshman. This time he opens his casebook and intertwines tales from his surgery and travels with reminiscences from childhood. We meet his parents, an assortment of colleagues and neighbours along with the marvellous Maxeen, his loving wife who has been at his side throughout many an adventure. 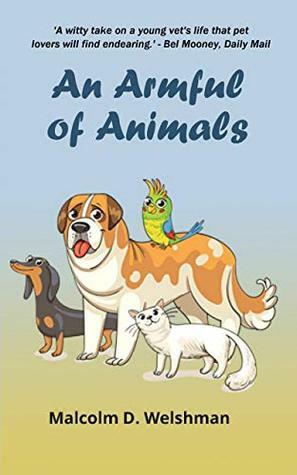 The structure of the book is straightforward with each chapter devoted to a different time and place, usuall ‘An Armful of Animals’ is the latest book from retired vet turned best-selling author, Malcolm Welshman. This time he opens his casebook and intertwines tales from his surgery and travels with reminiscences from childhood. We meet his parents, an assortment of colleagues and neighbours along with the marvellous Maxeen, his loving wife who has been at his side throughout many an adventure. The structure of the book is straightforward with each chapter devoted to a different time and place, usually with a bit of background and some lovely scene-setting to drop the reader into each particular situation. We first meet Polly the parrot (no marks for originality there, Malcolm) whom is purchased from a street market in Ibadan and watch as a touching relationship develops between boy and bird. It is testimony to the writing skill that we hold our breath as many years later, Polly becomes gravely ill. This necessitates Malcolm, by then a newly qualified vet, operating on his own cherished pet to save her life. Many of the outcomes are uplifting and positive but not all have a happy ending. The stories are sometimes poignant, occasionally a little sad but always fascinating. The author dips into his past with snapshots of time spent in Nigeria and later Kenya, before returning to England to take up practice in West Sussex, where he managed to fill his home with a succession of waifs and strays. He also introduces us to an eclectic bunch of pet owners and reminds us of the dangers of doing favours for friends. In addition, he touches on his own difficulties in a frank and honest manner which will give heart to some readers; although I suspect many may prefer an alternative coping mechanism! The author cleverly uses many literary devices; including colourful descriptions of both places and people, similes and metaphors along with gentle, often self-deprecating humour. These ingredients make the individual stories flow into each other and without doubt, shining through every encounter is the love and dedication Malcolm feels for all species of animal. The pictures painted of the Stockwell twins and their truculent Jersey, along with Miss MacTaggart and her verbally offensive parrot, were priceless. There is Polly the African Grey parrot, acquired in Nigeria where Malcolm’s father was based in the army. She was bought to England and loved to torment the poor little Maltese dog called Yambo by imitating the doorbell. She This is a delightful memoir written by a retired vet who first recalls his encounter with Nigel the Newt as a young boy. He goes on to tell us about his lifelong affinity with animals, stretched across several continents, and from both a personal and professional perspective. Malcolm's love and respect for animals is evident on each page of this book. His writing flows from one scene to the next in a way that makes it seem effortless. Descriptions come alive. I'm there on adventures, there as he assists in his first operation, which happens to be on his own pet Poucher, a bush dog. I have a squeamish stomach and most times skin over these scenes, but I was right there with him and he operated on his beloved African grey parrot, Polly. Some pet owners tried his patience and I can picture them as I read his words. One lady who insisted on home visits and tended to be very opinionated, diagnosing in a know-it-all manner makes me chuckle as I write. "Her torpedo eyes and scouring-pad grey hair." She had to take her cat in to see him a few days later, her diagnosis was incorrect. Poor kitty was on the mend after he found the real problem. I believe Malcolm's patients received excellent care and compassion. Perhaps they did know how fortunate they were, as animals can sense these things. They know when someone is trying to help them. (Maybe not the camel?) But even with the spitting camel, he was worried about his patient and relieved to see him limping along at the end of the camel train the next day. His last patient in the book and the words he chose to end it convince me they knew they were special to this vet who eased their pain. When, many years ago, I first read James Herriot, I was well and truly hooked by a capable vet’s experiences with small and large animals – and with a wide array of local characters – in a familiar and homely Yorkshire. Now, with An Armful of Animals, Malcolm D. Welshman has revived my enthusiasm with a fascinating collection of tales told equally well by a more widely-travelled veterinarian with experience of an even broader array of birds, animals, reptiles and their eccentric owners. The autho When, many years ago, I first read James Herriot, I was well and truly hooked by a capable vet’s experiences with small and large animals – and with a wide array of local characters – in a familiar and homely Yorkshire. Now, with An Armful of Animals, Malcolm D. Welshman has revived my enthusiasm with a fascinating collection of tales told equally well by a more widely-travelled veterinarian with experience of an even broader array of birds, animals, reptiles and their eccentric owners. The author is as at home in the middle of the Sahara Desert as he is in Bournemouth and as comfortable – well almost! – with a poodle as with a python, with a cat as with a camel, with the familiar starling as with a tarantula with a fungal infection. Welshman’s An Armful of Animals reads as if James Herriot had gone international and added a frolicsome and quirky sense of humour in the process. I devoured An Armful of Animals in one sitting and still have that warm sense of being thoroughly beguiled and delighted by an expert story-teller and devoted animal-lover. What a delight this book is. In it the author recounts stories from his childhood in Africa and one experience in particular which made him determined to become a vet.This was when his beloved dog Poucher was horribly injured and he was allowed to assist with his treatment. He has a wonderfully lively and descriptive writing style which at times had me laughing out loud. Be warned - he is a lover of the occasional pun which may make you groan ! However he can also describe a scene so beautifully What a delight this book is. In it the author recounts stories from his childhood in Africa and one experience in particular which made him determined to become a vet.This was when his beloved dog Poucher was horribly injured and he was allowed to assist with his treatment. He has a wonderfully lively and descriptive writing style which at times had me laughing out loud. Be warned - he is a lover of the occasional pun which may make you groan ! However he can also describe a scene so beautifully you can picture it. What a cast of characters, both animal and human! Tales told with such affection they cannot fail to keep you interested. I loved the chapter titles and the lovely little sketch which headed them as well. This book had me from page one! In this witty and heartwarming first memoir for retired Vet, Malcolm Welshman, we are treated with humours tales from animals to insects. From his childhood parrot to his devoted dog, Poucher, all the animals he encounters in Nigeria and back in the South of England lead him to becoming a veterinarian. While combining many stories of his veterinarian years in the clinic and the house calls he made, traversing around the downs in all types of weather to many a pat This book had me from page one! While combining many stories of his veterinarian years in the clinic and the house calls he made, traversing around the downs in all types of weather to many a patient that could not reach the clinic, you get to know some of the zany locals and their pets. A easy, flowing read, you will laugh and maybe have a tear or two. For animal lovers who enjoy light-hearted but heart-warming stories of what animals - and the vet who looks after them - get up to. Malcolm Welshman writes in an easy, comfortable style that will have you alternatively laughing, shedding a tear or holding you spellbound wondering how the next hilarious or lip-biting, heart-wrenching situation will be resolved. An ideal suggestion for a stocking filler for Christmas or a birthday gift. If you - love animals; love Africa; have a sense of humour; any or all of the above, then you’ll love this book. The tales and tails running through Malcolm Welshman’s life will have you shedding tears of laughter and sorrow. A most enjoyable read, highly recommended. As a lover of animals and nature, I found An Armful of Animals to be a delight to read. Malcolm Welshman writes with passion and humour, bringing to life a selection of tales, some funny and sometimes sad. He is a talented writer. I hope to read more. This is an absolutely delightful memoir and I thoroughly enjoyed it! I loved reading the different stories, the author's descriptive nature and writing style made the book additive for me and I know quite a few people that will love this and I have recommended it to them already. The author's ability to tell the tales really made this a stand out book for me - five stars from me, very enjoyable and I loved every page! I really enjoyed this memoir by Malcolm Welshman. Lovely ‘tales’ about various pets and patients - from boyhood to ‘vet-hood’ - a gentle read with lough out loud moments. I have no problem recommending this book and I will certainly read more by this author.